Netflix is under fire for pulling an episode of U.S. comedian Hasan Minhaj’s show “Patriot Act” from Saudi Arabia, after officials from the kingdom complained to the streaming company that it violated Saudi cybercrime laws. The episode was posted in late October, a few weeks after Saudi journalist Jamal Khashoggi’s murder in the Saudi Consulate in Istanbul. Netflix is under fire for pulling an episode of U.S. comedian Hasan Minhaj’s show “Patriot Act” from Saudi Arabia, after officials from the kingdom complained to the streaming company that it violated Saudi cybercrime laws. The episode was posted in late October, a few weeks after Saudi journalist Jamal Khashoggi’s murder in the Saudi Consulate in Istanbul. 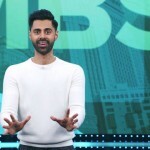 Hasan Minhaj sharply criticized the Saudi royal family and Crown Prince Mohammed bin Salman. The censored episode has been viewed more than 1.6 million times on YouTube, where it remains available to viewers in Saudi Arabia. On Wednesday, Minhaj tweeted, “Clearly, the best way to stop people from watching something is to ban it, make it trend online, and then leave it up on YouTube. Let’s not forget that the world’s largest humanitarian crisis is happening in Yemen right now. Please donate: help.rescue.org/donate/yemen.” Courtney Radsch is the advocacy director at the Committee to Protect Journalists, and Sarah Leah Whitson is the executive director of Human Rights Watch’s Middle East and North Africa Division. Democracy Now! looks at the remarkable story of Nadia Murad, the Yazidi human rights activist from Iraq who was recently awarded the 2018 Nobel Peace Prize. Murad was kidnapped by the Islamic State in 2014 and repeatedly raped as she was held in captivity. After managing to escape, Murad fled Iraq and has dedicated her life to drawing international attention to the plight of the Yazidi people. The documentary “On Her Shoulders” follows Murad as she shares her story with the world. The documentary has been shortlisted for an Academy Award for Best Documentary and recently received the Columbia Journalism duPont Award. The film’s award-winning director Alexandria Bombach is interviewed.